Published on October 19, 2018 in general and Life. 0 Comments Tags: Narayam, Thaliyola, Vidyarambham. Aum , Hari Sree ,Ganapataye Namah , Avighnamastu , Sriguruve Namah [ It means in English – Aum , O Lords , Hari, Sri and Ganapathi , We bow to you , Please remove all the obstacles in our life , We bow to our Guru[s] . Thereafter , we open a sacred text like Ramayana or Gita and read a few lines . 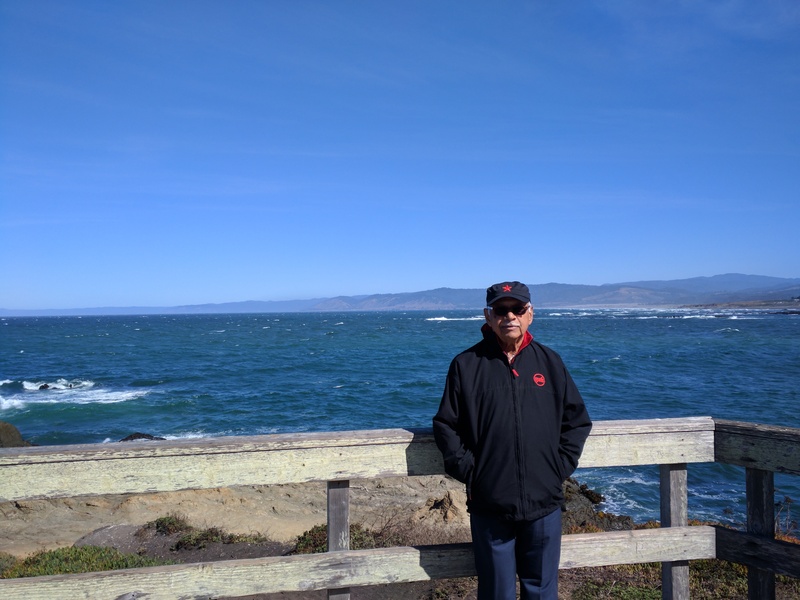 While my father initiated me to this when I was may be two and a half years old , I went through the rest of the learning process with many Teachers , Mentors and Gurus in my life span of 75 years with a work life spanning 52 years . 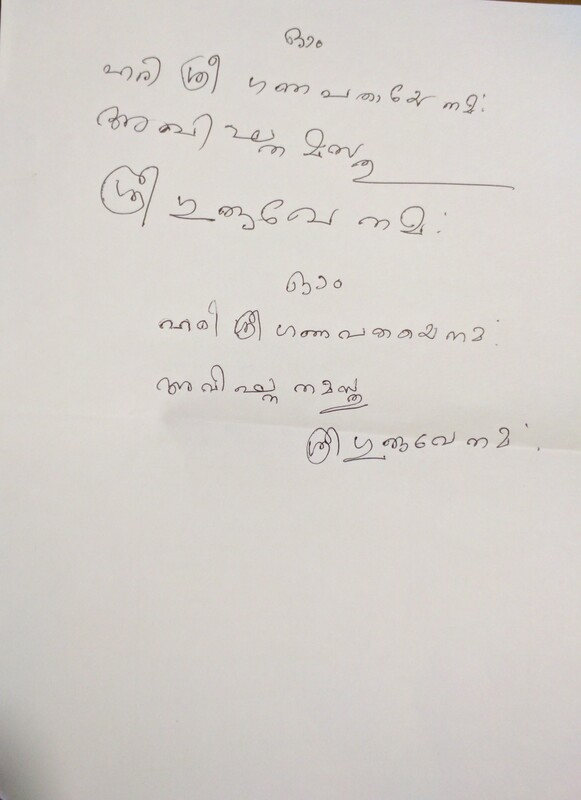 In the beginning , my first teacher Sanku Asan , taught me Malayalam alphabets writing on sand . Later , we used what is called ‘Thaliyola ” in Malayalam which means palm leaves using a ” Narayam ” – metal pin to engrave letters and words . By the time ,I went to school at the age of 5 , we had note books and printed text books supplemented by charts to teach Science and Geography . We never had electronic aids during our times. Most of the learning was through repetitive memorizing and retrieval during tests . Mechanical instruments , Log tables ,Laboratory equipment and slide rules were used during my Engineering Classes. I started using electronic calculators , main frame computers etc during the 80’s and Laptops during the 90’s . Mobile devices came to my help only during the late 90’s when I was working with the IT Industry. I used e-learning extensively to supplement my class room teachings during the later years and became reasonably literate in those areas also.Besides, during my long Army Service spanning 31 years ,I have used battle field simulation both during training and later during teaching. But , notwithstanding all these stages of learning , I never forgot my roots and the first initiation process of “Vidyarambham ” . An image of what me and my wife wrote on a piece of paper today is given below. Published on January 15, 2018 in general and Life. 0 Comments Tags: Dr Cliff Arnall, MDC[Mood Disorders Centre], Nona Walla, Prof Ed Watkins. I read an interesting article in the Times of India – Times Life pages yesterday . It talks about the Blue Monday on 15th Jan ,this year ,or for that matter , every year , when you are at your melancholic best ! – when you realize that most of your New Year resolutions have gone for a six ,out of your window. According to Dr Cliff Arnall , a psychologist , the third Monday of January is typically ” the most depressing day of the year ” . His formula uses factors in weather conditions,debt level ,time since Christmas , time since failing our New Year’s resolutions , low motivational levels and feeling of a need to take action, which all eventually add to stress levels and push us towards the ” Panic Button ” . The depressed mood is often exacerbated by perceiving a gap between how someone wants things to be and how they actually are. This real vs ideal discrepancies highlights in January because the ‘low’ followed by the festival season ‘high’ affects everyone and the stark contrast makes us feel inadequate. [ Prof Ed Watkins from the Mood Disorders Centre -MDC ] . We all face this ‘January Jitters ‘ – in different levels and severity . Take my case. I retired from active work life after 52 years as on 30 June 2017. 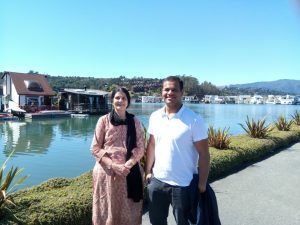 I traveled to the US with my wife to spend quality time with our children from July to November and afterwards spent a month in Kerala visiting our relations. We came back by end December and resolved to take many actions which will regulate our new-found and well-earned ” freedom ” beginning 1st January 2018 ! . One of my promise was to write a post every day and the other to go for a 40 mins walk twice a day [ it was once a day last year] . We also decided to check our income – expenditure status going forward and look for new avenues for savings/investments. Let there be light – Go outdoors in the sunshine. A choice of physical posture at work – it energizes and mentally stimulates you. Find a quiet zone – seek your quiet zone at work ,focus on your thoughts to increase your well-being. Use colour to set the tone- Choose colours wisely -Blue stimulates clarity,Yellow boosts creativity and lifts spirits and Green creates a sense of calming balance. Bring a bit of nature – into your workplace and home. While most of the above are ” Stress Busters” for the work place, I believe we can applied intelligently for a retired life as well and for housewives . Above all , remember that there are 12 months in a year and you do not have to meet everything by 15 January !!! Let us have action plans with milestones throughout the year and alerts regularly to warn you against any attempt to Procrastinate. Wish you all a very Happy , Stress Free , Healthy and above all Productive and Fulfilling 2018 ! Published on January 2, 2018 in general. 0 Comments Tags: NJT, North Brunswick. The US Railroads are in the firing line ! – The recent Amtrak train accident brought to focus the crying need for modernization of the aging rail system . In the US , railroads were never a priority in comparison to the vast road network which is always the preferred mode of transport both for people and freight. My daughter used to live at North Brunswick till last year and during my visit to them in 2011 , I learned about the new rail station coming up at North Brunswick off US Route 1 , near my daughter’s residence. We were happy as instead of going by road to New Brunswick to board a train to New York on the NJT [ New Jersey Transit] , we could walk across to the new train station. When we visited them again in 2013 , there was no visible progress in the construction of the station. We were there in July this year [ my daughter has moved to a locality near Princeton now] and was happy to see some construction happening at last!. Hopefully , the station will come up sometime in 2019! Unlike in India , there is no state level funding for such infrastructure projects in the US . The railroad company also will expect the local city government to raise funds for any such venture as their own resources are stretched . As a result ,if the public wants a facility like the new rail station, they have to raise funds from the local civic establishment . While going through the net for details on this new rail station, I came across a news item where more funds have been granted by the City Mayor’s office for parking facilities at the new station coming up . Thus, there is very visible participation by the public in infrastructure development which affects their day-to-day comforts . Truly a federal structure with distributed ownership at all levels . Do we have a good case study for Indian railways here? We keep complaining about various shortcomings in the Indian Railways but it is seldom that the state or local city establishments come forward with any helping hand to remedy the situation. May be we need to own up such problems and find local solutions . Published on November 21, 2017 in general. 0 Comments Tags: All India Radio, Annamacharya, Carnatic Music, Chalakkudi Narayana Swamy, Kerala State, Mavelikara, Mavelikara Krishnankutty Nair, Melakarta Ragas, Mridangam, Pandit Bhim Sen Joshi, Travancore-Cochin State, Vijayawada, Violin. 22 November 2017 is the first death anniversary of Padma Vibhushan Late M Balamuralikrishna, Carnatic Vocalist, Musician, Multi-instrumentalist, Playback Singer and Composer – one of the greatest gems of Indian Music with a record of 25,000 concerts worldwide. This blog is a brief story of his very first concert in Kerala – based on my memory after 60 plus years of the event. To begin with, I need to fill in some background information to set a context to the event. I was born at a small town Mavelikara in the southern part of Kerala. In our town, there is a famous Krishna temple and every year during March, there was a 10 day long festival. As the town has a long tradition of developing and nurturing Carnatic Music talent, be it vocalists or percussion instrumentalists, the temple committee used to have one musical concert per day in the evening after the pooja and other rituals from the 4th day of the festival to the 10th day. While the concerts on Day 4 to Day 8 were offered to local talents, the 9th and 10th Day were reserved for eminent artists of the region. On the 10th Day, we used to have music concerts by famous vocalists like G N Balasubramaniam, Madurai Mani Iyer, Alathur Brothers, Semmangudi, Ariakkudi etc accompanied by violinists like TN Krishnan, Chowdaiah or Lalgudi Jayaraman and percussionists like Palghat Mani Iyer, Muruga Bhupathi or Palani Subramaniam Pillai. My father, Late P Krishnan Nair, an advocate, was the President of the Temple Festival Committee during 1955 to 1960 and the other Committee members were drawn from among the eminent citizens of the town. Even as a school student of 13 or 14, I used to work with my father in co-ordinating his activities connected with the festival. I remember it was either during 1956 or 57 temple festival that one of the committee member Mr Gopala Pillai informed the committee that he heard from his brother Mr Sakhtidharan Nair who was Station Director for the Vijayawada station of AIR [All India Radio] about one Balamuralikrishna, a very young Carnatic music vocalist, a child prodigy, who started singing classical music from the age of six and gave a public concert at the age of eight at Vijayawada. This boy in his late 20’s is already a sensation in Andhra and Madras and no less than the best of vocalists at that time in Carnatic music. Mr Nair said he can get him to perform at our temple festival, if the committee wishes to do so. Mr Nair also suggested that we get the violinist and percussionist at our end for the concert. The committee made some reference checks with experts at Chennai and decided to experiment with Balamuralikrishna for the 10th Day music concert that year. Shri Chalakudi Narayana Swamy and Mavelikara Krishnan Kutty Nair were selected to be the violinist and percussionist on mridangam respectively for the concert. Both of them were very famous in Kerala already and performed for major vocalists earlier. 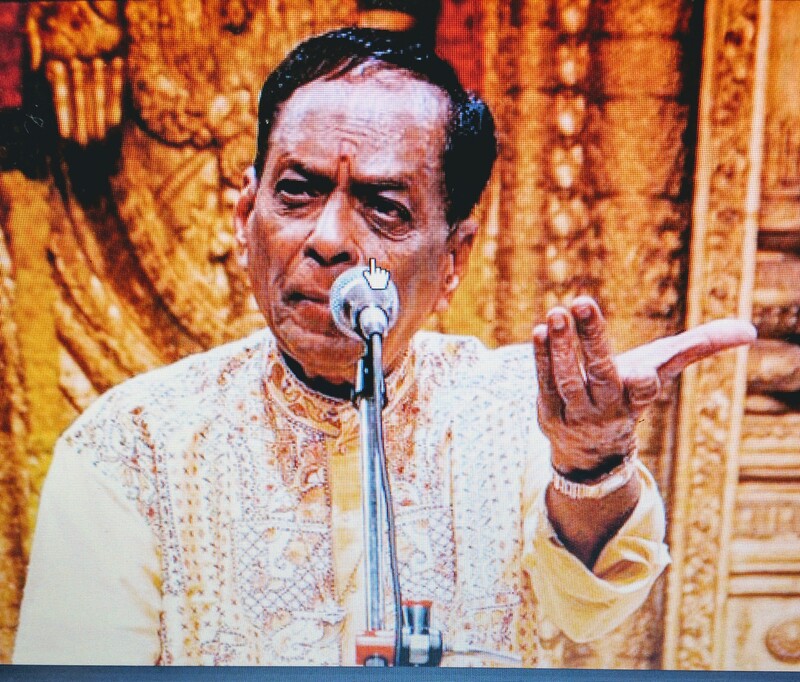 In the printed program for the festival, the new vocalist was announced as “Ganasudhakara Mangalampalli Balamuralikrishna” from Vijayawada, performing for the first time in Kerala State. Normally, the music concert used to begin at about 9 PM and go on for about 3 hours most. As we had many knowledgeable people in the audience who were well versed with the nuances of Carnatic music, there used to be a separate enclosure for them, marked as such in front of the stage. The purpose was to encourage the artists with meaningful gestures, following the raga, thana and pallavi throughout the concert. This arrangement used to work well and about 100 people used to fill these seats voluntarily, out of a mass of about 1000 plus audience attending the event. On the scheduled day, Mr Balamuralikrishna arrived an hour early and was introduced to his other two accompanying artists. None of them had met earlier. The program started at 9 pm sharp and within a few minutes, the audience was mesmerized by the melodious voice of the vocalist. He initially spoke in English, introduced himself and talked about his interest in research on the Carnatic ragas and offered to share some of it during the concert. After an hour or so singing traditional ragas, he introduced a raga named Rohini to the audience and went on to sing the raga, thana and pallavi in that raga [Maamava Gana Lola] with the violinist and mridangam artist accompanying his rendering in a very spirited manner. The audience, needless to say sat transfixed enjoying the treat throughout the program. 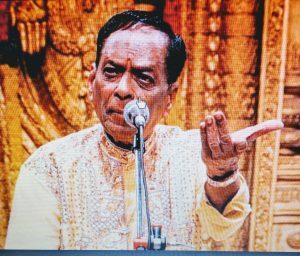 As per requests from the audience, Balamuralikrishna continued with the concert for more than four hours and ended the program at about 1.30 AM with great applause from everyone. Many organizers from other temples in Kerala were present during this program, having heard about this new artist and I understand Mr Balamuralikrishna got many bookings on that night itself. I also remember our Committee paid only the airfare from Chennai to Cochin, the taxi fare and overnight stay at Mavelikara along with a token amount to the singer for his maiden concert in Kerala. I never got a chance to listen to Balamuralikrishna in person again but have enjoyed listening to his discs, cassettes and now YouTube programs, whether as a vocalist in Carnatic music or a jugalbandi with the likes of Pandit Bhim Sen Joshi or playing violin solo or playing other musical instruments with elan. His contribution to the Annamacharya Kirtanas and Rabindra Sangeet will always be remembered by all the music lovers across India and abroad. He has created 18 new ragas and has composed in all the 72 Melakarta Ragas of Carnatic music. His penchant for experimentation and creativity leaves a rich legacy difficult to emulate. Long Live the Memory of this Great Thespian of Carnatic Music! Disclaimer: The above story is purely based on my memory and association with the event at Mavelikara 60 years ago. It is prone to minor inaccuracies which are not intentional. I do not remember if the concert was in 1956 or 57 and therefore it is possible that the artist’s maiden performance was in the erstwhile Travancore-Cochin State if the concert was before 1st November 1956 when the Kerala state was formed. Published on November 7, 2017 in general. 0 Comments Tags: Bulganin, Chengdu, Chinasoft, CPI, CPM, Daugavpils, Gorbachev, Indira Gandhi, Jack Ma, Joseph Tito, Karl Marx, KGB, Khrushchev, Kim Jong-un, Latvia, Lenin, Moscow, Nasser, NATO, Naxalites, Nehru, Panchsheel, Political Commisar, Shastri, Soviet Union, Sukarno, Travancore-Cochin, USSR, Vladimir Putin, Xi Jinping, Zhou Enlai. Today on November 7th , Communism completes 100 years of existence in the world. The 25 October 1917 date when the Bolsheviks under Lenin uprooted the Czarist Regime in Russia by staging a coup is now corrected as 7 November in the reformed Russian Calendar. During these 100 years , the ideology of Karl Marx devoted to abolishing markets and private property left a long and bloody trail of destruction in Russia, China , Cambodia , Vietnam and Indonesia – eliminating dissent of all forms through mass killings, state sponsored terror, deportations, forced labor camps and genocide. Communism ushered in to the world as an alternative ideology, condemning capitalism , promising a better world for peasants and workers through state ownership of property , enterprise and welfare measures. Depending on local conditions , it took different forms in Russia [ which became USSR till it got disintegrated again thanks to Gorbachev ] ,China , Vietnam, Cambodia, Indonesia, North Korea and Cuba. But after a century of communism in power – with hold outs even now in Cuba, North Korea and China , Communism as an ideology has failed to meet the goals for which it started at the first instance. While under Vladimir Putin [ A photograph of Putin riding a Harley Davidson Bike made in USA fascinated me ]in Russia is moving towards an autocracy while embracing market economy to a great extent , the Chinese after Mao Zedong beginning with Deng and now Xi Jinping follows a mixed economy under the one party rule !. While the Communist Party started in India soon after the Russian Revolution, It was after Independence that it gathered political steam. During the 50’s , they were a weak political force in India while advocating labor reforms except in West Bengal , Telangana region and in the erstwhile state of Travancore and Cochin where they were very active among the working class . While Nehru was toying with the idea of Socialism thanks to his visit to the Soviet Union in June 1955 and as a result of the much publicized return visit of Bulganin and Khruschev to India in November 1955 , he never liked Communists . His ambition along with Nasser of Egypt , Sukarno of Indonesia and Joseph Tito of Yugoslavia to carve out a Non – Aligned Block in the world worked against both the Communist Nations and the Capitalist Nations like the US and UK. The annexation of Tibet by China in 1959 in spite of the “Panch Sheel ” agreement signed by Nehru with Zhou Enlai in the mid fifties followed by the India-China war of 1962 also alienated Nehru with China. The Russians used this opportunity to build bridges with India and followed up with a long era of friendship and co-operation and military assistance in times of crisis . This to some extent pleased the Indian Communists. Shastri and Indira Gandhi after Nehru also followed this policy which helped the country during the 1965 and 1971 war with Pakistan.After the 1964 split of the Communist party in India , today it is CPM and not the CPI who enjoy a sizeable following in some parts of India. 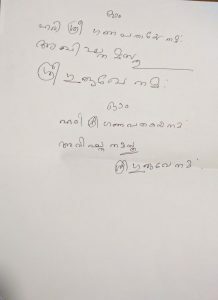 Now , some personal experiences – I became aware of Communism at the age of 10 in 1952 , when they were banned by the Government of Travancore and Cochin, my home state , in 1952 because of their radical activities in the state. I remember it was probably in 1953 or 54 when I almost witnessed the murder of a Police Officer Bhasi by one Thampi from the underground Communist Party by stabbing in public view near our school after a football match. I believe both Bhasi and Thampi were close friends and Bhasi spotted Thampi in disguise watching the football match. Bhasi accosted him with friendly overtures and tried to take him to the police station nearby . Thampi detecting the ruse stabbed him on the way . Thampi was captured with the help of some enterprising on lookers and handed over to the Police. I also remember the Hindi – Chini Bhai Bhai slogans and the Panchsheel agreement between Nehru and Zhou Enlai in 1954 and the visit of Bulganin and Khruschev to India in 1955 . The landmark victory of the Communist Party in 1957 in Kerala in the State Elections surprised the world – the only time the party came to power on its own through the ballot box. Soon, sweeping land reforms were introduced in Kerala and I remember my father , a lawyer , talking about it many times. He himself had to surrender some of his property assets to those who lived there as our contract workers. I happened to visit USSR in 1977 as part of a three member team from the Army for a period of 45 days for training and knowledge transfer of some military equipment we were acquiring from USSR. For the first time, I saw Communism in action in Moscow during our first briefing – the tight security , spartan living conditions but friendly public and above all , the scars left by war everywhere. We moved to Daugavpils in Latvia [ now an independent country aligned with NATO ] for our training. We had an interpreter [ we were told by the Indian Embassy in Moscow to watch out as he could be from the dreaded KGB] always staying with us in the same hotel. Here ,we could see poverty everywhere and the life of the public including marriage functions, entertainment , holidaying all regulated and controlled by the state apparatus. People used to drink heavily to forget their woes. No one was permitted to talk to us without our interpreter present with us , even if they could converse in English!. Stocks of grocery including milk and bread was over by Friday evening everywhere! Priority was given to Heavy Industry and defense over other sectors !.A political Commisar in Army Uniform addressed us and spoke highly about the Communist Party in Soviet Union and how they look after the welfare of the working class. Our Interpreter told us that every Army Unit or Establishment has the Number 2 place occupied by party leaders! Fast forward to 2007 , I visited Chengdu in China to attend the Chinasoft Seminar as a delegate representing the IT Industry at Hyderabad where I took up a job after my Army Career. Alibaba of Jack Ma was present in the Expo .I found in Chengdu a vibrant society , still under State Control thanks to the effects of a mixed economy . People were tech savvy and very friendly . China has made great strides in economic progress by then compared to India. Infrastructure development was visible everywhere , be it the giant IT parks, highways or the airport. Communism is no longer relevant in its traditional form – but some of the offshoots like Naxalites are a threat to the civic society in many parts of India . In West Bengal , CPM is no longer in power and in Kerala they are in power as a coalition of parties with different ideology. Globally , the Communist regimes with single party rule are more of autocracy with leaders like Putin, Xi Jinping or Kim Jong-un almost enjoying positions for life . With the advent of technology breaking geographical barriers , the age-old class distinction which was the breeding ground for Communism has ceased to exist except in some pockets. But the violent memories and the legacy remains! Chinese Premier Xi Jinping – A Party of One ! Published on November 1, 2017 in general and Leadership. 0 Comments Tags: Andrew Browne, Charles de Gaulle, Hu Jintao, Jiang Zemin, Joseph Stalin, Lee Kuan Yew, Mao Zedong.Den Xiaoping, OBOR, Paul S Buck, POK, Shinzo Abe, Vladimir Putin, WSJ. Andrew Browne in his column – China World in the Wall Street Journal today describes the Chinese Premier ‘s election victory last month as ‘ A Party of One ” . Xi Jinping was re-elected unanimously for another term – for life ? – as for the first time in several decades ,the succession question is open as the 19th Party Congress did not name a successor to Xi . Also after Mao’s legacy , this is probably the first time that a leader’s thoughts got included in the policy framework of the Nation. The world has seen ‘cult ‘ figures in national leadership roles like Joseph Stalin , Mao Zedong , Charles de Gaulle and Lee Kuan Yew who wielded great power with almost no opposition politically. Will Xi Jinping reach this level as the third generation leader in China after Mao and Deng ? – Vladimir Putin is a close contender to Xi Jinping in this aspect in Russia. I took interest in Chinese history first time after reading the books – The Good Earth and Dragon Seed by Pearl S Buck. The first Chinese Revolution of 1911 which overthrew the Imperial Dynasty and the second Chinese Revolution of 1949 when Mao Zedong created the Peoples Republic Of China attracted a lot of attention of the world. The Sleeping Dragon of the Peasant and Cycle days of China went through a great Cultural Revolution through the ” Great Leap Forward “. China remained closed and isolated from the world for some more time until the Tiananmen Square protests of 1989 – the first and probably the last efforts for democratic rights and pluralism with a multi party framework ! . The Annexation of Tibet by China in 1960 and the US – China Rapprochement of the 70’s through the good offices of Henry Kissinger were strategically important developments of the century and altered the power balance post World War Two . But the new ‘ Avtar ‘ of China really came about thanks to the adoption of market economy by Den Xiaoping during 1978-89. While Jiang Zemin and Hu Jintao who followed Deng kept the new momentum , it was Xi Jiping in a short period of five years after taking over , kicked off many initiatives during his term towards bringing up China as the second most world economic power after the US . His new ambitious Infrastructure Initiative – The One Belt -One Road [ OBOR] towards Globalization of Investments in a multi nation road map for 30 plus years is the talk of the global strategists today. This $5 Trillion project integrates the old silk routes through the land with a new maritime silk road covering Asia, the Middle East ,Europe and Africa. The project involves Roads,bridges ,gas pipelines,ports,railways and power plants . China always believes in dreaming BIG as is clear from their many large infrastructure projects within China in the recent past as seen in Shanghai, Dalian and in Chengdu. The US,Japan and India have expressed reservations on this project for strategic reasons – India because the OBOR passes through POK – a disputed territory between India and Pakistan and the US and japan because of its objections on the maritime routes . Recently, Shinzo Abe, the Prime Minister of Japan has mooted an alternative to OBOR with Australia,India and the US participating in it. While China stands poised for greater laurels in the World Economic Scene, many analysts predict the bursting of the Bubble in the near term. While Mao and Deng were cult figures loved and revered by the Chinese Public, Xi Jiping is yet to acquire this status. Another issue of global impact is the defiant nuclear posture of North Korea which will test the leadership of Xi Jinping to a very critical level ! Only time will tell if this ” Party of One ” will vindicate the trust placed on him by the Chinese Polity. Published on October 29, 2017 in general. 0 Comments Tags: 17 Mile Drive, Alice's Restaurant, Apple, Carmel Mission, Carmel-on-the Sea, Carrier Pigeon, Clint Eastwood, Facebook, Google, Half Moon Bay, Hofsas House, HP, Juan Rodriguez Cabrillo, Kelp Forest, Lone Cypress, Monterey Aquarium, Monterey Bay, Monterey Canyon, Moss's Landing, Mountain View, Oracle, Palo Alto, Pebble Beach, PGA, Pigeon Point, Point Pinos, Santa Cruz, Silicon Valley, Stanford, Wood Side. 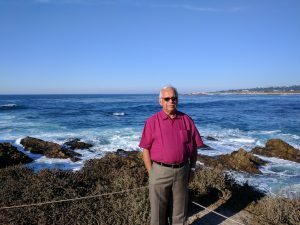 After our great road trip to the North of San Francisco up to Fort Bragg, Eureka and beyond, we decided to explore southwards on the Pacific Coast up to Carmel -on -the Sea covering a round trip of 300 miles. While the northern trip was through wine country and redwood forests, the southern trip was through farm lands, pine forests and many tourist spots rich in history and scenic beauty. We had a very enjoyable weekend road trip for three days on 13-15 October. 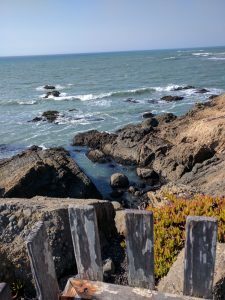 We selected California State Highway Route 1 which hugs the sea-coast for our onward journey via Pigeon Point – Santa Cruz – Monterey Bay to Carmel and on return took a diversion near Santa Cruz via Route 17 over to Route 101 for our return journey to San Francisco. 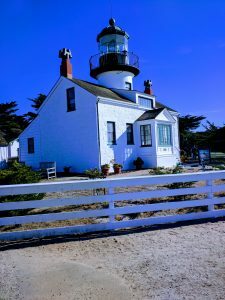 The drive through Route 1 was memorable because of the number of small beaches on the Half Moon Bay, Historical Pigeon Point Light House where the Carrier Pigeon Cargo Ship wreck happened on 6 June 1853 and the beautiful Monterey Bay where we rode astride farm lands growing Artichoke, Lettuce, Pumpkins and strawberries. 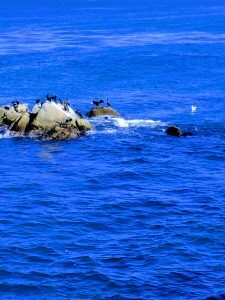 The Monterey Bay extends all the way south of Santa Cruz City till the Monterey peninsula and Carmel highlands. A very important area from a geological point, the Monterey Canyon, one of the largest underwater canyons in the world, begins off the coast of Moss’s Landing exactly at the center of the bay. 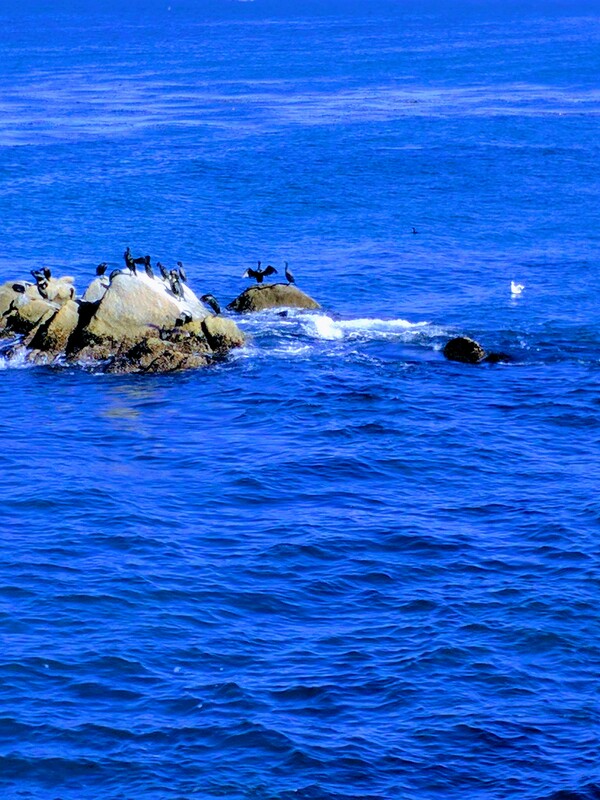 Many species of marine mammals including sea otters, harbor seal and bottle nose dolphins are found in this area. It is also in the migratory path of gray and hump back whales. Several varieties of Kelp grow in the bay some of these as tall as trees. The California State University founded in 1994 at Monterey and uses the facilities donated by the military. We chose Hofsas House in Carmel town, a quaint hotel with old world charm for our stay for two nights. While Carmel-by-the Sea is famous for its white beaches, the town with rolling hill sides has fairy tale cottages, art galleries and the historic Carmel Mission. Spanish explorer Juan Rodriguez Cabrillo first sighted this place with beautiful beaches and pine forests 50 years after Columbus discovered America. Carmel is famous for its celebrities including Clint Eastwood, the well known movie star who was the Mayor of Carmel during 1986-88. More than 200 movies and TV Commercials were shot in this scenic place. Today, Carmel is one of the costliest real estate in the US. Carmel town has excellent restaurants for breakfast, brunch, lunch or dinner and the waiting time is anything up to an hour. On a weekend, it is very difficult to get reservations for dinner. Mostly Italian, Mexican, Mediterranean and West Coast American food is available. 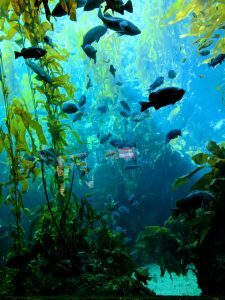 On the second day, we visited the Monterey Aquarium – one of the largest aquarium dedicated to the rich marine life obtaining in the Western Coast of US. 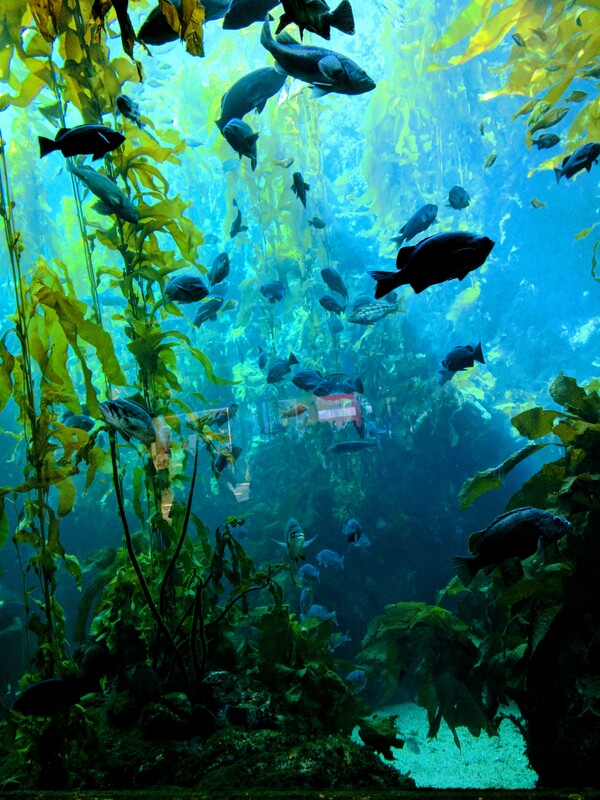 The live Kelp Forest and a variety of Jelly Fish displayed was a great attraction. 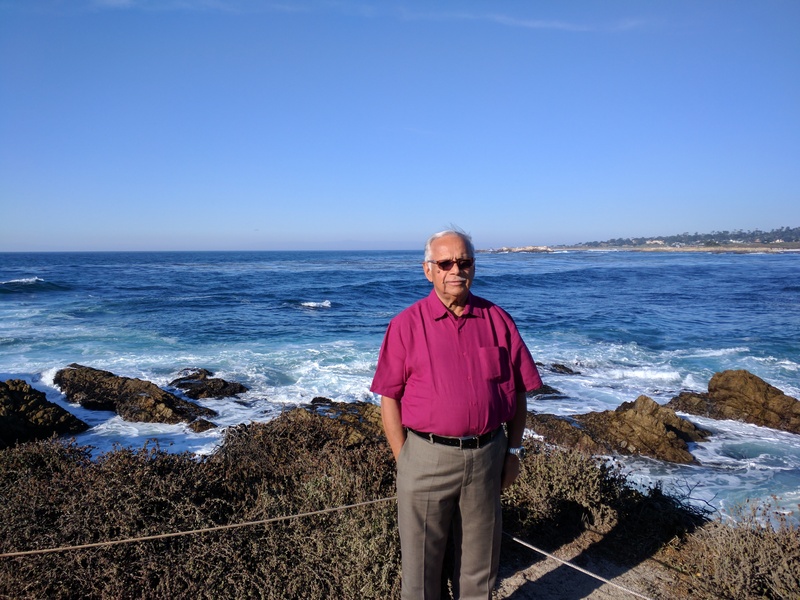 Thereafter, we drove through the Pacific Grove to the Point Pinos Light House and over to the beautiful 17 Mile Drive on the seashore amidst thick cypress forest on one side and the Pebble Beach on the other side. 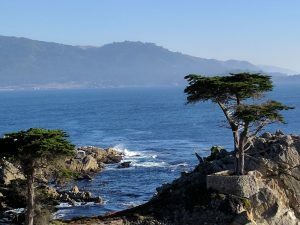 Pebble Beach has some of the finest golf courses where PGA tournaments are held, on the 17 Mile drive, there are 21 points of tourist interest, the Lone Cypress being the most photographed spot in the west coast. We left Carmel on the third day and drove through mountain roads to Wood Side, on the Biker’s Routes and had a sumptuous lunch at the popular Alice’s Restaurant on the hill top. After lunch, we drove through the Silicon Valley crossing Mountain View- Google and Palo Alto where the well-known Garage Museum of HP is located. 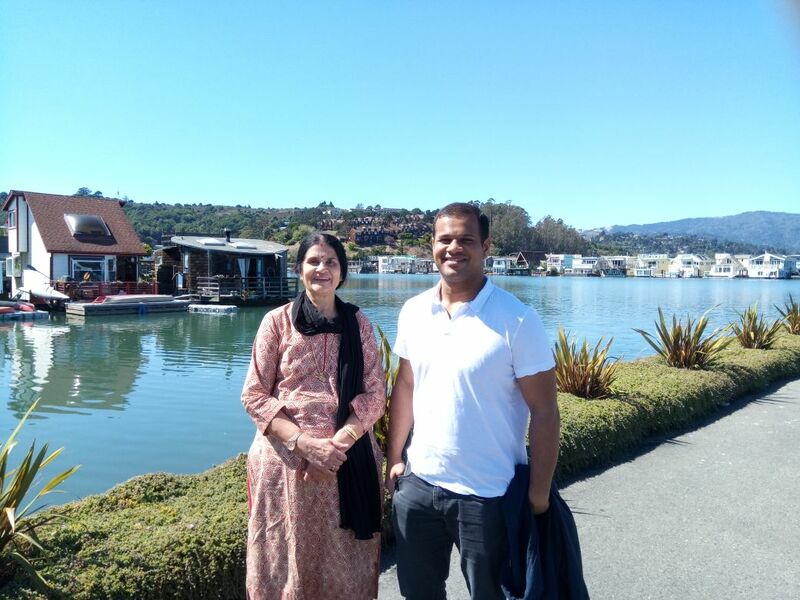 The visit to the Silicon Valley and the Bay Area, the Mecca of IT with Stanford University, Apple, Oracle, Google, HP, Oracle and Facebook was a pilgrimage for me, having worked with the IT Industry for 20 years after my Army Service. 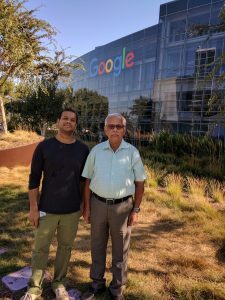 Besides, it was my wish to visit the HQ of Google at Mountain View along with my wife and son Raghu who works for Google at San Francisco. 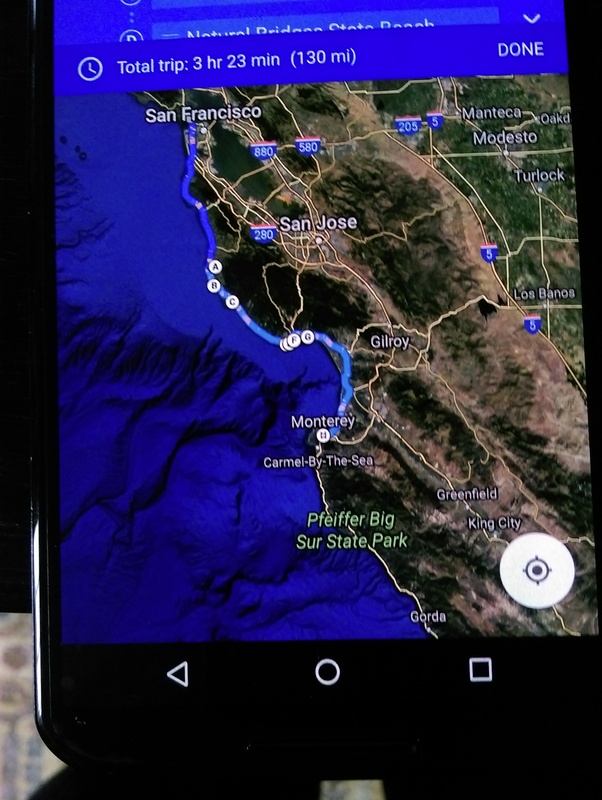 We followed Route 101 back to San Francisco. Published on October 11, 2017 in general. 0 Comments Tags: David's Deli, Eureka, Fort Bragg, Holiday Inn Express, Humboldt County, McKerricher Park, Mendocino County, Napa Valley, North Coast Brewing Company, Ocean View Lodge, Petaluma, Santa Rosa, Sonoma County, Zazzle Cafe. 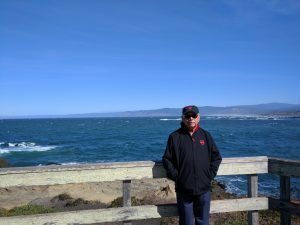 We were out on the road for 3 days , covering about 800 miles with two night halts at Fort Bragg from 6th Oct to 8th Oct to explore the Northern part of California. The scenic beauty of this part of California – mountains with thick foliage interspersed with a number vineyards and wineries between and the rugged Pacific Ocean on the western side dotted with many beaches , provides a great panorama of the nature . There are many lakes , two major rivers – the American river and the Russian river [ name connected with the Russians who worked for the American – Russian Company here way back in 1800 ] providing irrigation and adventure sports in this sector. 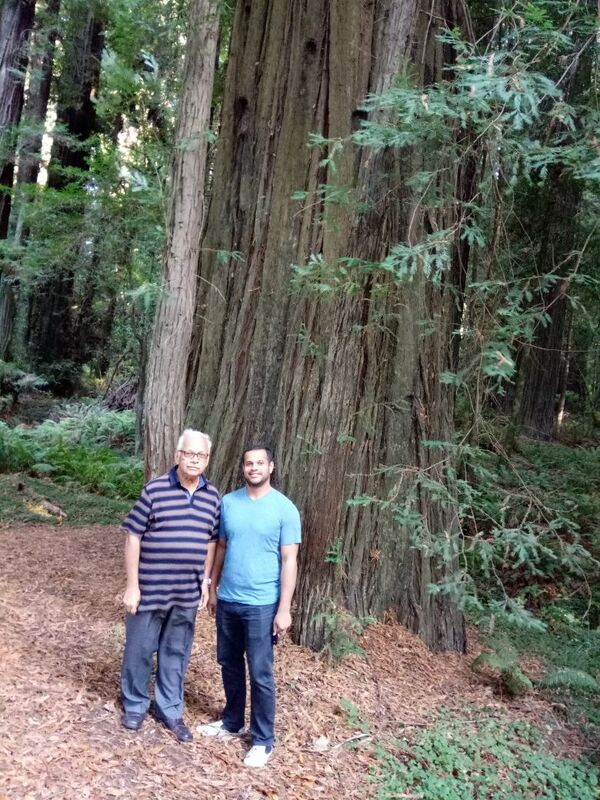 The Redwoods Forest area is a major attraction to unwind and enjoy the nature in its purest form . 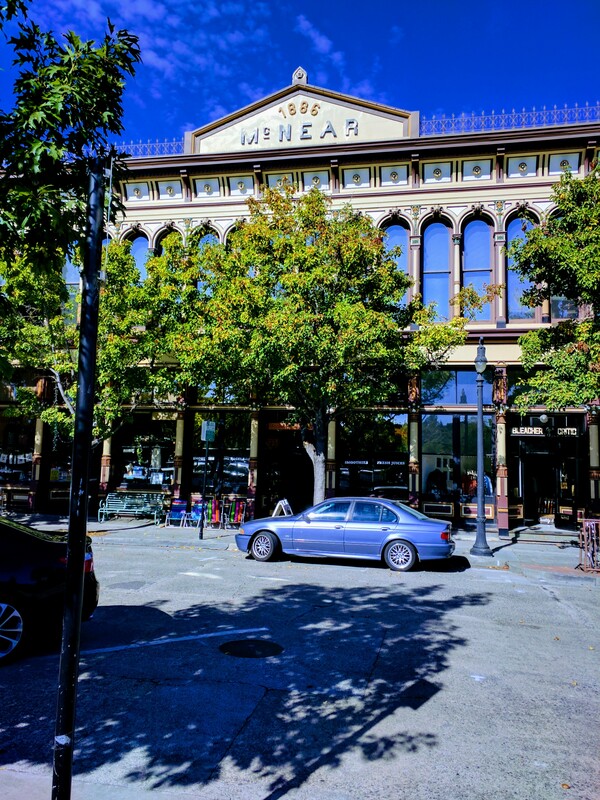 Two major towns – Fort Bragg and Eureka on the Ocean front are rich with history and provides some very good restaurants and hotels for stay . 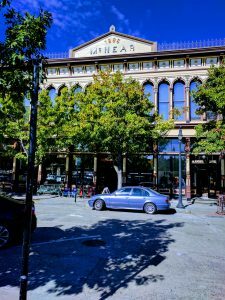 While Fort Bragg in the Mendocino County has its origin before the American Civil war as a military garrison , Eureka in the Humboldt County caters for the timber trade from the Redwood Forests and later with the Gold Rush during the 1850 and beyond. There are many tourist attractions near these port cities. On the way , we can also enjoy the scenic beauty of two small townships – Petaluma and Santa Rosa – mainly catering to the farming community of this area. We started from San Francisco in the forenoon , passed through the Golden Gate Bridge and traveled through Route 101 to Petaluma where we had lunch . We had to take a diversion before reaching Petaluma due to a traffic jam and this provided us with a good drive through some farm lands enjoying the village scenes on the way. 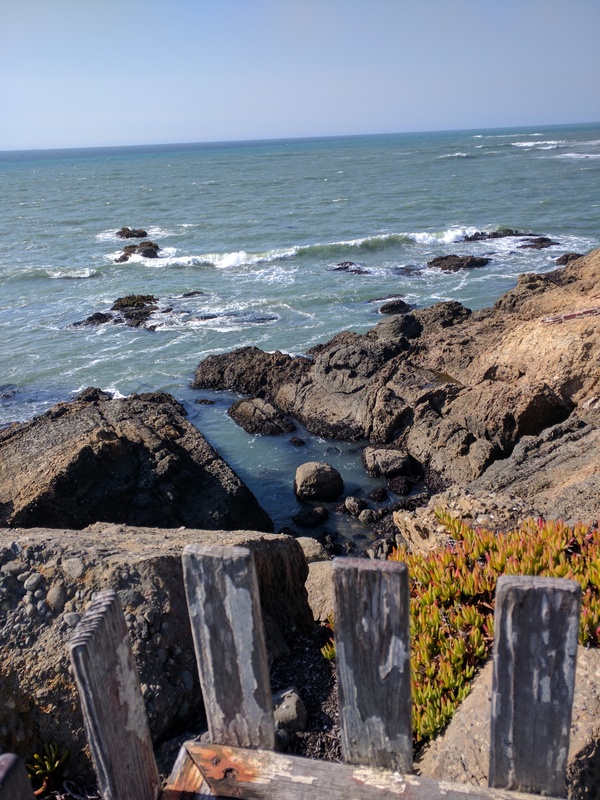 After a good lunch at Cafe Zazzle ,with sea foods and salads , we proceeded to the Bodega Bay and got back to Route 101 via Guerneville in the Russian river valley of Sonoma County. Here again, we could witness some rustic village life with many farms and vineyards around . However, the prolonged drought conditions in California was visible in the mountain slopes all around and chance of forest fires are more now in this part of the countryside. Back on Route 101 , we proceeded to Willits and from there cut across via a winding road for 30 miles to reach Fort Bragg on Route 1. We stayed for the night at the beautiful Ocean View Lodge which offered an uninterrupted view of the ocean . 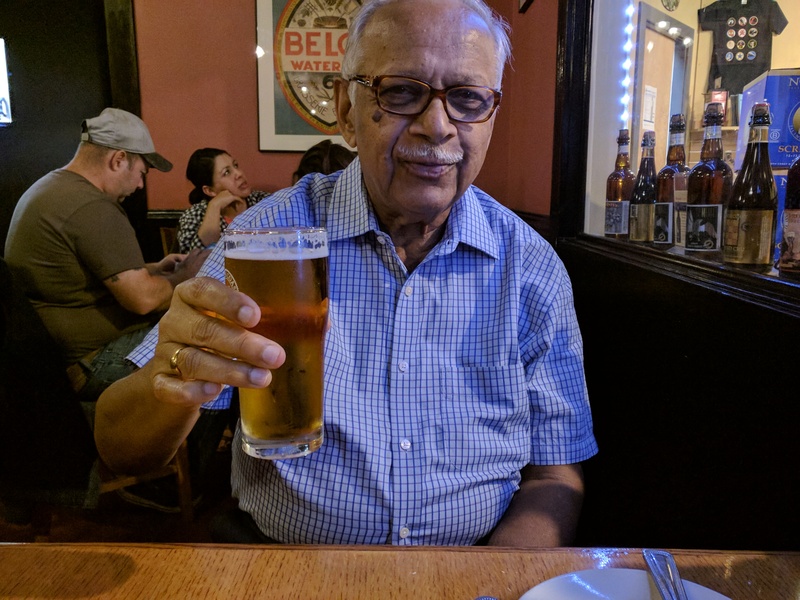 At night , we had dinner at the Tap Room of the famous North Coast Brewing Company and tasted some of their popular beer. In the morning , we took off to Eureka and beyond to get a good feel of the Redwoods Forest . 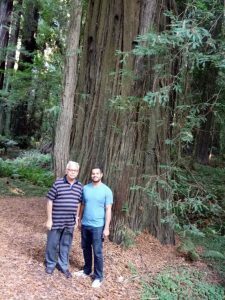 The best part of this tour was the drive through the famous Avenue of the Giants , the road going through the forest reserve with very tall redwood trees on both sides with a rich foliage all around. It was a memorable experience ! We got back to Fort Bragg for the night halt at the Holiday Inn Express . On the third day, we visited the beautiful McKerricher State park overlooking the ocean and got back to San Francisco by late evening. What was noteworthy during our stay in Fort Bragg was the community spirit displayed everywhere during our interactions. During our breakfast in the David’s Deli , we found the entire hotel staff and the guests present there joining the birthday celebrations of a veteran dining there. Before I could publish this post , a great tragedy happened in the North Bay area centered around Santa Rosa and Napa Valley where Forest Fire created havoc for 48 hours on the 9th and 10 th of October , causing 21 deaths, complete damage to 2000 properties and displacing more than 20,000 people.About 23,000 acres of farm land and vine yards got in the fire. The situation is still serious when I write this post! Published on September 28, 2017 in general and Leadership. 0 Comments Tags: DSSC, Formosa, Henry Kissinger, Mao Zedong, Premier Xi Jinping, President Donald Trump, President Nixon, Taiwan, William B Saxbe, Zhou Enlai. The nonagenarian master strategist and American diplomat Henry Kissinger spoke at the Columbia University on 26th September at the US-China University Presidents and Think Tank Forum.He described the US- China relations as the ‘ defining ‘ relationship of the 21st Century and suggested that from a rational day-to-day working relationship , this should raise to a conceptual level for ‘ Global Peace and Human Progress’ .Kissinger should know as it was he who initiated this relationship way back in June 1971 , when he traveled on a secret mission via Romania and Pakistan to meet up with Chinese Premier Zhou Enlai and Chairman Mao Zedong at the behest of President Nixon ,ending China’s isolation for 30 years from the western world. I recall an incident in 1975 , when I was undergoing the prestigious staff course at the Defense Services Staff College [DSSC] , Wellington , Nilgiris , India . The then US Ambassador to India William B Saxbe was a guest speaker and one of my colleague asked him an awkward question – ” Sir , US treated China as an untouchable till 1971 , and suddenly , we find that President Nixon sent his Secretary of State Henry Kissinger secretly to China to meet up with Premier Zhou Enlai – How do you explain this incident in the context of morality in International politics? ” – The Ambassador did not like this question and avoided a direct answer initially . But later on , he stated that it was in the strategic interest of the US to have opened this so-called Track 2 diplomacy in 1971. Rest is history now as the above initiative was soon followed up with the Nixon – Zhou Enlai summit in Beijing in 1972 and a new chapter began in the US- China relationship , though formal diplomatic ties came about only in 1979 because of the US stand on Formosa – now Taiwan. This major break through paved the way for a ‘détente ‘ with USSR later and helped both the countries to enter trade relations for mutual benefit . However , in the eyes of the US , China remains a potential adversary but an economic partner , in spite of the poor human rights records of China and the status of the largest foreign creditor of the US ! . In the present North Korean crisis , the US – China relationship assumes a great significance and a summit meeting between President Donald Trump and the Chinese Premier Xi Jinping is on the cards soon. Experts believe that this meeting can pavé the way to diffuse the tension and bring North Korea to the negotiation table to settle the Nuclear Issue. Published on September 26, 2017 in general. 0 Comments Tags: Avatar's, Golden Gate Bridge, Marin County, Miwoks, Richardson Bay, William A Richardson. During last week-end , we drove across the Golden Gate Bridge in San Francisco to visit the beautiful Sausalito city ,about 10 miles from San Francisco . This place has a rich history, originally occupied by the coastal Miwoks , later with the Spanish occupation of the Bay Area and the independence of Mexico.The development of the area was initiated by William A Richardson who arrived in California in 1822. The place initially named Rancho Saucelito – meant a small cluster of willows , with a fresh water spring. Before the opening of the Golden Gate Bridge in 1937, Sausalito was an important ferry connecting the North and South across the Bay. Interestingly , many people still use the ferry to reach their work place in San Francisco regularly . The present city is part of the Marin County spread across an area of 2.26 sq miles [0.49 in water] with 7000 plus population. 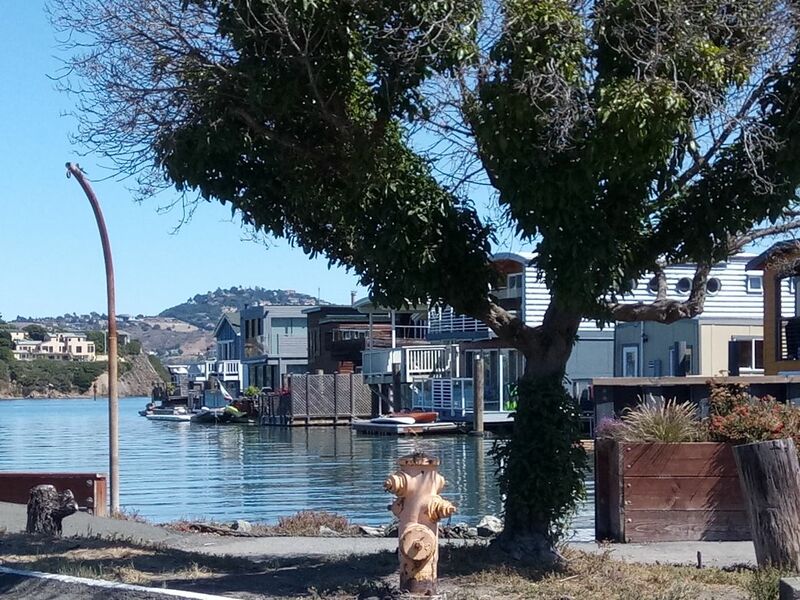 An important tourist attraction of Sausalito is the enclave of houseboats , now permanently anchored to the water front on the Richardson Bay . These got built by artist squatters after World War Two , initially to avoid taxes . Those days, there was a thriving ship building industry in Sausalito. The city has a beautiful coast line on the Bay on one side and a hill-side opposite to the Bay . Being a tourist attraction very close to San Francisco , there are many good restaurants with Mexican , Italian and American cuisine . 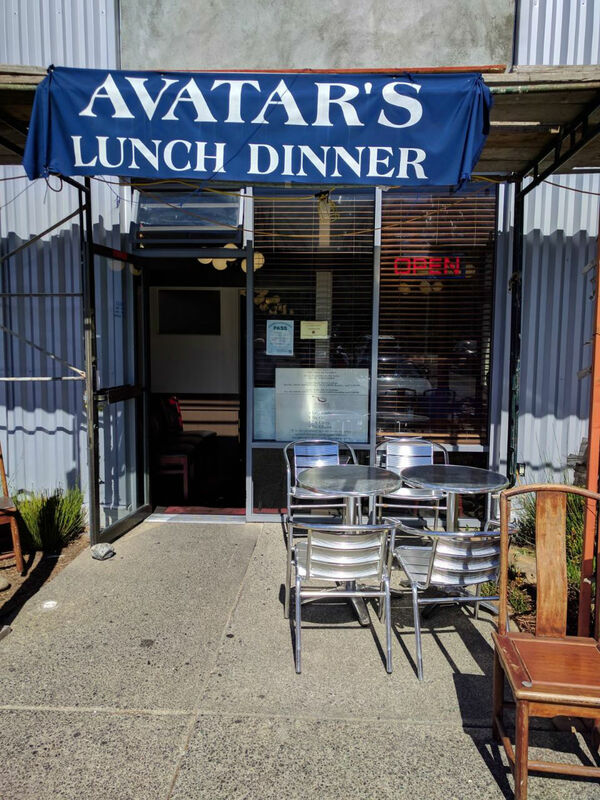 We spotted an Indian Restaurant named Avatar’s which is famous for their Indian – Mexican fusion food. We were in for a very pleasant surprise for lunch when Mr Ashok Kumar greeted us and suggested a mysterious assortment of Punjabi and Mexican food ,ending with his main attraction – namely a dessert called Avatar’s Dream. 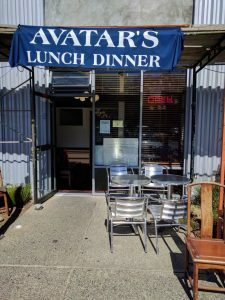 The food and hospitality were excellent and it was definitely a great place in Sausalito. Blockchain 2.0 – The Technology of 2018 for a new economic and social infrastructure.